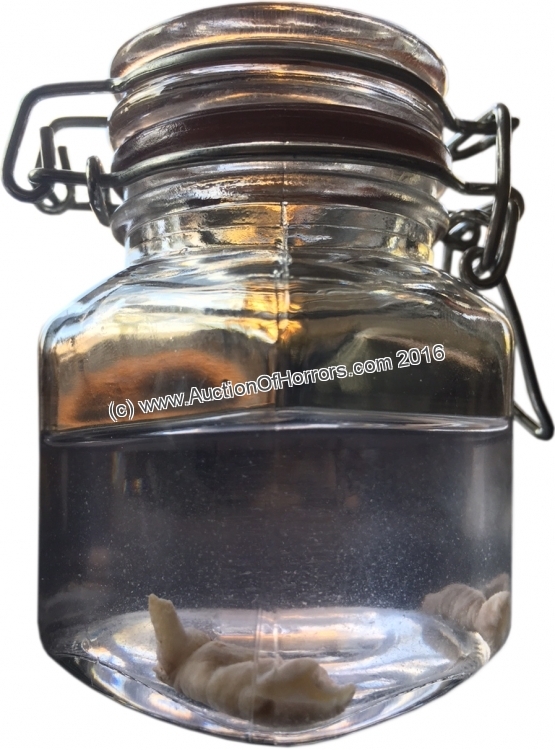 from our insane friends at the Circus of Horrors comes what has to be the oddest thing any auction has ever offered! 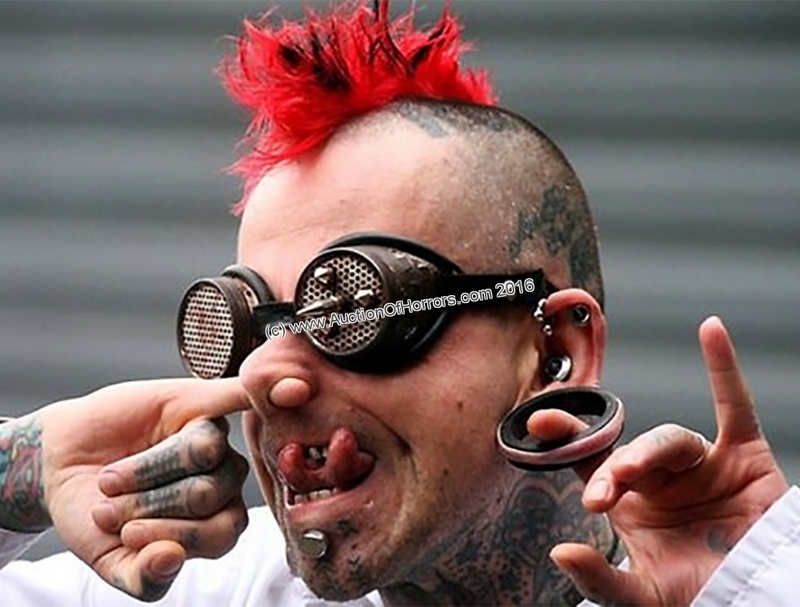 World-famous record-breaking sword-swallower extraordinaire Hannibal Hellmurto is also known for his extreme and bizarre body modifications... but this time he took it too far! His massively stretched earlobes finally cracked under the pressure and had to be amputated. 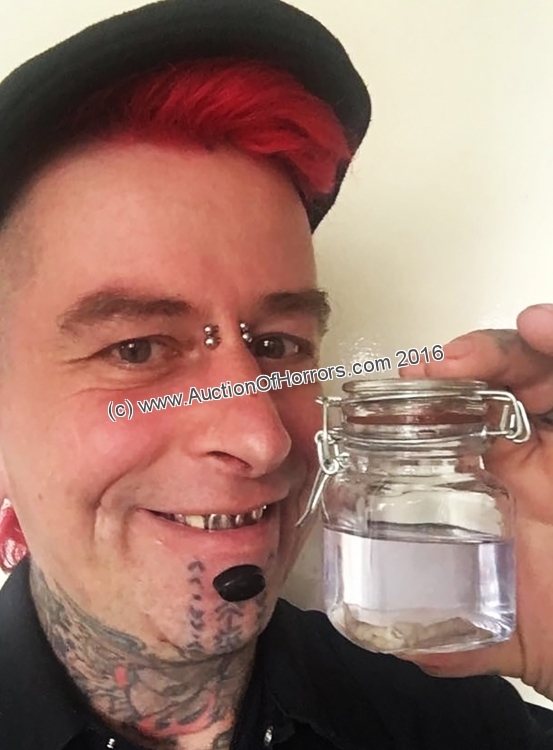 However, rather than sending them to the hospital incinerator, Hannibal has decided to give one lucky fan the unique opportunity to really own a piece of their favourite freaky circus performer, as he had his lopped-off lobes pickled for posterity! Human taxidermy of any kind is extremely rare and highly sought-after by secretive collectors. Skulls and bones of the deceased are difficult to come by, but chunks of flesh of a living person are unheard of. Whilst there have been a couple of incidences of people &apos;selling&apos; an area of their body for someone to add a tattoo, of course the buyer doesn&apos;t actually take possession of that skin. This, however, is something altogether different. As far as we know we are the first auction house to ever sell physical chunks of flesh of a living person that the buyer can take home and proudly display on their mantelpiece next to a photo of the mother-in-law. If you want truly unique talking point for when the vicar comes round for tea, you&apos;ll never beat this!